Hikvision is set to bring new levels of security to convenience stores, hotels, restaurants, offices and other small-to-medium enterprises with the introduction of the DS-2CD2942F Fisheye Network Camera. Pro-Vision Distribution Limited, the distributor of branded CCTV and access control equipment, has recently signed an agreement to supply and support the Portal Plus range from Videx Security. 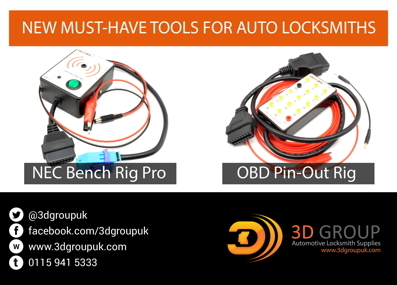 UAP Tradelocks have designed and recently launched a brand new kit for those people who need to gain lawful access to a domestic property, or those who are just starting out in the locksmith trade. Patlock is a unique lock for French doors and conservatories. It works by holding the internal handles in place and preventing break ins and theft from lock snapping. You may recognise us from BBC's Break in Britain, which demonstrated how well the product works and created huge interest and demand from both trade and general customers. MPL / Locksmiths Tools returns to the LaSM exhibition once again. We look forward to demonstrating our new products and meeting customers old and new! MPL specialise in supplying specialist uPVC spares and repairs to the trade, all at great prices with next day delivery. Why not give us a try? HomeGUARD - is an ideal Letterbox Home Security product for the protection against Anti-Social Behaviour, Increase Security with a Lockable Letter Plate, Large Capacity Fireproof Bag and Easy to Install. HomeGUARD+Plus - is all of the above but has installed within the bag a Heat Detection Tube (Extinguisher) the +Plus version should be installed where there is an extreme threat to life - Arson Attack. Yale Locks & Hardware offers homeowners a new level of convenience and security with the introduction today of the first NFC residential door lock designed for the U.S. market, operated with the tap of a smartphone app. The Airport Swinglane self-boarding lanes will be installed at Xiamen International Airport before the end of the year. This project will be the first self-boarding project in China which is not installed as part of a pilot program. Windowparts Ltd is a market leader in uPVC and aluminium repair products. Forever pushing the boundaries of innovation and problem-solving, we are proud to introduce our latest addition to the renowned Flexi Range: The Flexi Espag Rod. It is the only truly universal espag rod, designed to cope with all the variants. Keyless locks for all requirements. From simple combination cam locks to RFID access control systems, we have a full range of specialist keyless locks to solve your security problems. Come and chat as see what we have to offer. The Netatmo Welcome has been designed to recognise family members and other people who frequently enter the home - or any other building. When it recognises someone, the wi-fi connected system can immediately send a notification with their name to your smartphone. Leading physical security product supplier Securikey has extended the best-selling Mini Vault safe range with the Mini Vault 3, which offers a wider interior space that is ideal for storing till drawers in a retail environment or large binders of important documents in domestic or commercial applications, in addition to cash, jewellery and other valuables. Over the last few months, Genuine Lishi has concentrated on renovating and revamping their extensive collection of top of the range supplies, and has recently taken the market by storm with yet another unique and innovative product launch. Pop-a-Lock "America's most trusted locksmith company"
Pop-a-Lock has reportedly emerged as America's most trusted locksmith company. The St. Louis based firm caters to both residential and commercial locksmith services as well as automotive requirements. A new range of learning resources has been launched by Highfield.co.uk to help educators and learners with recently updated security qualifications. The new qualifications were launched after a review into learning in the sector in 2014 by the Security Industry Authority (SIA) which affected licence-linked security units, and resulted in qualifications containing these being withdrawn and replaced with immediate effect on 1 January 2015.
icomply have recently partnered with TIS, one of the UK's leading independent fire, security and communications specialists, on overhauling the security system of Boots UK - one of the largest commercial brands currently operating in the country. The central security control centre at Boots had long since been in need of an update, with many of the current analogue hardware becoming unfit for purpose and difficult to gather data from. Understand how attackers are taking advantage of gaps between defender intent and their actions in order to conceal malicious activity and evade detection. During December CLCS relocated their manufacturing and offices to ASSA ABLOY UK's primary manufacturing facility at Portobello in Willenhall, Woverhampton. Lockexpo latest - last-minute stand available! The annual Lockexpo, sponsored by Tradelocks is ready to run on the 7th and 8th March 2015. Due to staffing problems one exhibitor has had to drop out so we do have one stand free if anyone needs to exhibit - call me 01359 241699 first to call secures. The PR is ramping up with only 5 weeks to the show, many exhibitors informing customers of their attendance. Because we feel it will be exceedingly busy we are taking extra staff to run the reception desk. You can help by pre-registering and printing or downloading to your phone the QR code generated for fast entry. This will speed the issue of your show pass. Asec Security has been the Locksmiths' trusted choice, for over 12 years. With a portfolio of over 1,800 products the extensive range includes; Access Control, Architectural Hardware, Key Cutting, Locking Products, UPVC, Tools and Accessories. The new Kite Elite anti-snap cylinder range will be showcased. The cylinders offer a TS 007 3 Star Kitemark rating, which offers ultimate protection against cylinder attacks. Today's security means greater challenges to Locksmiths. These include security protected letterboxes, stronger latch springs, PAS24 handles and Anti-snap Cylinders etc. Our tools have built-up a reputation of getting the job done efficiently, effectively and saving time. The legendary 'SideWinder' from 2010, quickly followed by the 'Evolution', changed the way Locksmiths use the Letterbox Tool. Leading physical security product supplier Securikey will in addition to running an exclusive soon-to-be-revealed product promotion during the show, the company will be exhibiting the brand new Mini Vault 3 range for the very first time. Launched in January 2015, Securikey's Mini Vault 3 safe range was developed in response to customer requests for a larger safe that could accommodate standard till drawers and large binders in addition to cash and other valuables. The Broadband Security Centre provides all you need to get started for you to install wireless alarms and monitoring services for your customer. From demonstration equipment cases, wireless systems, monitoring services and FREE installation training up to City and Guilds standard the BBSC is always at your service. Install the latest 4th generation wireless security with 64 zone panels sending images with audio sent using 868 MHz and not Wi-Fi up to 650 metres range from battery powered combined camera detectors indoors or outdoors. Mul-T-Lock UK are demonstrating their locksmith inspired access control system, Genesis; the easy to install and manage wire free electro-mechanical system. In addition the ArmaDLock van security lock is on display along with installation movies showing Locksmiths an easy way to develop a new business opportunity to work alongside their daily core activity. The UK Anonymisation Network (UKAN) is holding four half day workshops and four clinic sessions between now and the end of March to help organisations who are responsible for anonymising their data. In December, the Court of Justice of the EU made a notable ruling* in a case the ICO has been following closely, on how data protection law applies to individuals using surveillance cameras to protect their property. The judgment ruled that a household's usage of a CCTV camera that filmed both their own driveway and the street outside their house was not covered by the domestic exemption for images recorded of people outside their property. Crewe-based family business, Holdfast Security Systems, is celebrating 25 successful years in the security industry. Established in December 1989 by brothers Simon, Richard and Chris Griffiths, Holdfast offers a range of services from key cutting and lock servicing to installing intruder alarms for both individuals and major companies in the area as well as all over the country.